Spending time in the yard with family and friends is one of the highlights of the summer months. Whether it’s a cookout or a few beers on the lawn, warm evenings offer a great excuse to get outside and enjoy the weather. Unfortunately, such pleasant occasions can be quickly ruined by the dreaded “buzz” of mosquitoes. These common bloodsucking insects may be small, but their bites can bring on extreme irritation. Luckily, there are some great homemade repellents you can employ to keep your yard mosquito-free. In this article, we show you how to quickly identify a mosquito infestation, as well as how to make a natural mosquito repellent at home. Out of the 3,500 different species of mosquito in the world, only 176 species reside in the United States. This is little comfort if you find yourself under attack while trying to enjoy some time in your yard. After all, a single hungry mosquito can transform a fun evening with friends into a rather painful experience. If you want to know whether you have some unwelcome visitors lurking in your yard, you need to go out and do some detective work. Mosquitoes are rather adept at hiding themselves away when they’re not biting you or your friends. However, if you know where to look, you can easily find out if you have a mosquito problem. The best areas to start looking for evidence are those which have standing water. Mosquito eggs need water in order to breed. Even if you don’t have a pond in your yard, you can still harbor mosquitoes. A very small amount of water will be enough, such as some rainwater which has collected in an old plant pot. Any standing water which isn’t regularly disturbed will provide an attractive breeding ground. Female mosquitoes lay their eggs in batches of around 50 to 100 at a time. These batches will stick together in little clumps, about ¼ inch in diameter, floating on the surface. You can find them anywhere which holds still water—they could even been in your pet’s water bowl. Female mosquitoes lay their eggs at night. The eggs appear white in color when first laid, but change to a blackish color over the next 24 hours. The larvae will hatch quickly, usually within three days of being laid. Mosquito larvae look like little wiggly worms. They are aquatic, staying in the water and feeding on algae and microorganisms. Breathing through their tails, the larvae spend the majority of their time hanging upside down on the surface. They wiggle and twitch to move through the water, looking for food and avoiding predators. The larvae do not stay in this stage of the life cycle for long. They can develop into pupae within as little as five days. Mosquito pupae don’t eat. They simply move slowly about in the water. Their bodies are short and curved, with little flippers at one end to enable them to swim. Mosquito pupae will be easily visible on the surface. They have tiny breathing tubes, so tend to stay at the surface of the water unless they are disturbed. If this happens, they will appear to sink quickly to deeper water. After a little time has passed, they will return to the surface again. If you discover any mosquito larvae or pupae in your yard, it’s best to deal with them right away. The quickest and simplest way to destroy them is by placing some oil on the surface of the water. The oil will prevent their snorkels from breaking through to the air and taking breaths. If you have taken a good look around your yard and not found any evidence of breeding mosquitoes, this doesn’t necessarily mean you are safe. Another way to tell if you have these bloodsuckers on your property is to examine any insect bites you receive when outdoors. You may not notice when you’re being bitten by a mosquito. The saliva secreted when feeding is responsible for the irritation and itching reaction shortly afterwards. The offending mosquito has usually had its fill and left by the time you notice these sensations. Irritation caused by mosquito saliva is a response by your immune system to a foreign substance. Your body begins to release inflammatory chemicals as a defense mechanism. This causes the bite location to swell. Blood vessels in the immediate area also dilate, giving rise to redness. Shortly after being bitten, the bite location itself rises into a puffy, pale lump. The edges are often misshapen and uneven. If you press upon the bite, it will feel soft and spongy. 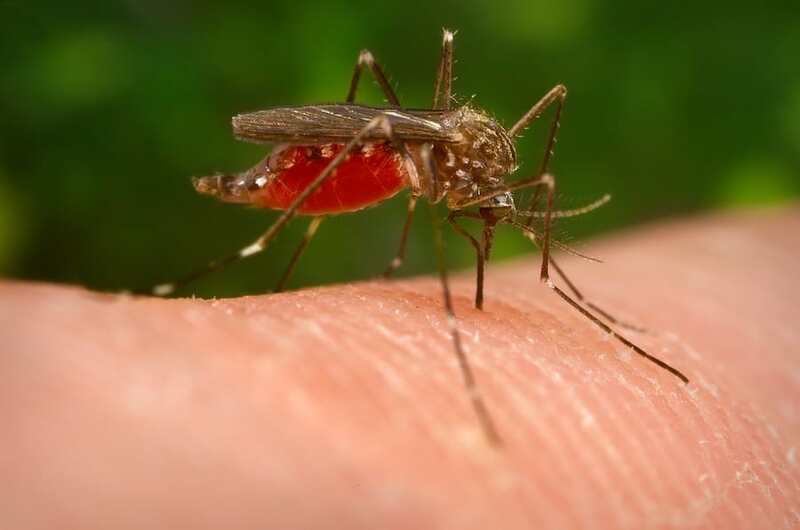 Over the next few days, a mosquito bite will often harden into a small red lump. By this time, the irritation has usually subsided, but can be reactivated if you scratch it. If you’ve found evidence of mosquitoes in your yard or on your skin, it’s time to take action. Otherwise, these pests will almost certainly ruin any quality time you intend to have in the yard during the evening. While there are a wealth of safe mosquito sprays available for your yard, more people are gravitating towards natural products. Conventional insecticides can pose risks to our health if used incorrectly, as well as the integrity of the surrounding environment. Alternative natural and homemade options can be very effective, without the use of harsh chemicals. Many botanical chemicals, essential oils, and extracts are known to be potent insect repellents. For example, garlic contains a chemical known as allicin, which has been shown to be an effective pest repellent. In fact, gardeners and farmers have used garlic for generations in their battle against insects. Natural mosquito control can be a healthier and more convenient way to keep mosquitoes at bay. You can even introduce certain plants into your yard that emit aromas mosquitoes hate. These pests will actively avoid lavender, catnip, citronella, geranium, catmint, clove, mint and lemongrass. Unsurprisingly, the essential oils derived from these plants are also effective repellents. You can mix any of these into homemade mosquito repellent sprays for an extra kick. Such natural treatments are less toxic to pets, children, and your plants than chemical pesticides, but some caution is still required, as we’ll discuss later. Outdoor homemade mosquito sprays act as a natural barrier, discouraging biting insects from residing on your property. Applying homemade mosquito repellent to your yard can be as effective as professional treatments, if carried out correctly. However, they will need to be applied more frequently due to the lack of preservatives. Homemade repellents always have a shorter shelf life than chemical treatments, but this is a minor issue for those who wish to avoid pesticides. Homemade repellents are inexpensive to make, so more frequent application won’t break the bank. Depending on the ingredients, homemade repellents can remain effective from one week to three months after application. This recipe is a favorite home recipe which has been passed down through family generations in the USA. It may sound a little odd, but it really is effective. This spray is very economical to make and has a refreshing scent. The cheap beer is overpowered by the mint fragrance in the mouthwash, so you don’t need to worry about your yard smelling like a bar. This formula will deter mosquitoes and other troublesome insects for two to three months. Pour the beer and mouthwash into an adequately-sized container. A bucket or an old saucepan are good options. Stir the two ingredients together and add the Epsom salt. Give all the ingredients a good mix until the salt is completely dissolved. This mixture is completely safe for pets and children, but you shouldn’t use the areas until they are dried out. If you do, this can impact the effectiveness and durability of the treatment. Onion and garlic are usually the go-to base for any tasty dish. Few people realize that these common pantry ingredients are also super-effective at repelling biting insects such as mosquitoes. This spray recipe is perfect for yards, gardens, and lawns. Once applied, it will continue to repel mosquitos for approximately one month. Homemade mosquito repellents are generally much safer than pesticide alternatives, but this doesn’t mean they do not pose any risks. Essential oils should always be kept out of reach of children and animals. Furthermore, certain plants can be especially toxic to your family pet. Garlic is extremely toxic to cats and dogs. Consumption of small amounts can result in severe, sometimes fatal poisoning. Onion is also a member of the same family as garlic (Allium family). Cats and dogs are incapable of digesting these plants in the same way as humans. Therefore, something which seems harmless can result in deadly consequences. The consumption of plants in the Allium family causes the destruction of red blood cells in dogs and cats, which results in a serious form of anemia. It can also cause inflammation of the digestive system, resulting in extreme pain. Essential oils can also be very poisonous to pets. Cats are particularly sensitive to essential oils, as they lack a liver enzyme which enables them to break down toxins. Essential oils should be kept away from children. Young children are much more likely to ingest things they shouldn’t. This risk is amplified further by the attractive scent of essential oils. These risks can be very easily mitigated by keeping your spray hidden away out of the reach of little hands or paws. When you apply the solution to your yard, simply keep pets and children away until it has dried. As long as you follow these precautions, you will have no reason to be concerned about using a homemade repellent. Mosquitoes are an unwelcome guest in any yard. Relaxing evenings on the deck are impossible when you become the focus of a feeding frenzy by these infuriating insects. Homemade mosquito repellents are a great way to make time in the yard fun again. They are an effective alternative to harsh chemical yard treatments. They’re simple and inexpensive to make, by using common ingredients found in almost every household cupboard. If used correctly, these homemade sprays can protect your yard from these nasty insects for many months.